I'm pleased to introduce today's guest editor, Helen Driggs. Helen is the managing editor of Jewelry Artist magazine in which she writes a regular column, Cool Tools & Hip Tips. She also writes the free newsletter, Jewelry Artist Flashcard, which is published every other week. Helen will be a guest on Beading Daily several times this year writing about the tools needed for metal jewelry work.–Michelle Mach, Beading Daily editor. If you’ve been a beader or wire jewelry artist for quite some time and have mastered a repertoire of techniques, chances are high that you might get the urge to go beyond beads to try your hand at some simple metalwork. I made bead and assembled jewelry for more than 20 years before I touched a torch, but once I was “bit by the metal bug,” there was no turning back. My first formal metals course included a 3 hour studio introduction, with a tool-by-tool demo by my teacher. She stressed the importance of learning which tools were used for what, and how to properly use them to avoid damaging the tool, the metalwork, or the maker. It is important to respect and care for tools, because they are very expensive and if you become serious about metalwork, you’ll acquire them one by one for a very long time before your studio is fully equipped. I’ll start today with the B & S Gauge. You may already own one, but if you don’t, you’ll want one eventually. This thick steel tool is a measuring device for both wire and metal sheet. 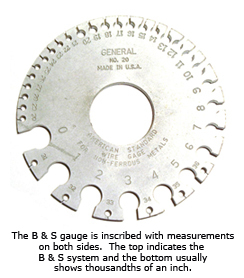 B & S is short for Brown and Sharpe (also known as American Standard or American Wire Gauge) and is a universal system for finding the gauge, or thickness, of metal. The larger the number, the thinner the metal. You can usually purchase a B & S gauge from a jewelry supply house, a well-equipped bead store, or from online jewelry tool vendors. If you are in Europe, a British Standard Sheet and Wire gauge is the equivalent tool. You’ll notice the gauge has both slots and circles cut into its circumference. To use the gauge, insert metal sheet or wire into a slot where you think it will fit. You want the metal to fit snugly into the slot but without bending or forcing. To gauge the metal sheet or wire, read the number inscribed next to the slot. The circles on the tool have nothing to do with wire size. 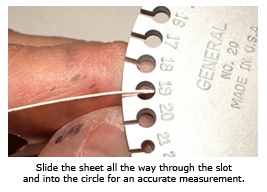 They are there to allow a sheet edge to be inserted past the entire slot for measuring accuracy. This method works the same for wire. Even though the wire is round, slide it well into the slot in order to measure it accurately. If the metal you are measuring is too big for one slot and too small for the next size down, it is usually safe to go with the smaller size on the gauge, unless the metal is very thick. In that case, digital calipers might be a better tool to use for gauging, but you’ll have to translate your measurements to millimeters. Why is the B & S gauge important? Whenever you purchase metal sheet or wire, the second question a vendor will ask you will be: “What gauge?” (The first question they’ll ask is: “What metal?”) For the most efficient service, you’ll need to know the type of metal, the gauge (how thick) you want, and the sheet dimensions, usually in inches. Try to purchase sheet with one dimension at 6”, because sheet metal from the mill comes in either 6” or 12” increments. Some vendors won’t make two cuts without charging a fee. Expect to spend between $17 and $25 for a good quality, accurate B & S gauge. You’ll use this tool nearly every time you get to work, so purchase with a lifetime of use in mind. Take care of your gauge so you don’t drop it or ding it. I keep mine in a plastic sleeve in my bench drawer. Have fun measuring, and check out my monthly column, “Cool Tools & Hip Tips” in Jewelry Artist magazine. 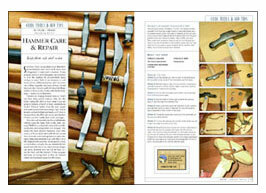 I talked about drawing and design tools in the March issue and will discuss hammers in the upcoming April issue. Or, meet me at Bead Fest Philadelphia, August 20-23, 2009. I’ll be teaching two sessions of Getting Started in Metals, a hands-on class for beaders who don’t own any metalworking tools but are ready to add metalwork and metalsmithing tools into their jewelry making. Sign up for Jewelry Artist magazine’s free newsletter, Flashcard for more tips and information about metal jewelry. Helen Driggs is the managing editor of Jewelry Artist. If you have comments or questions for Helen, please post them on the website.